New members must complete both a Membership Application & Launch Liability Acceptance form. 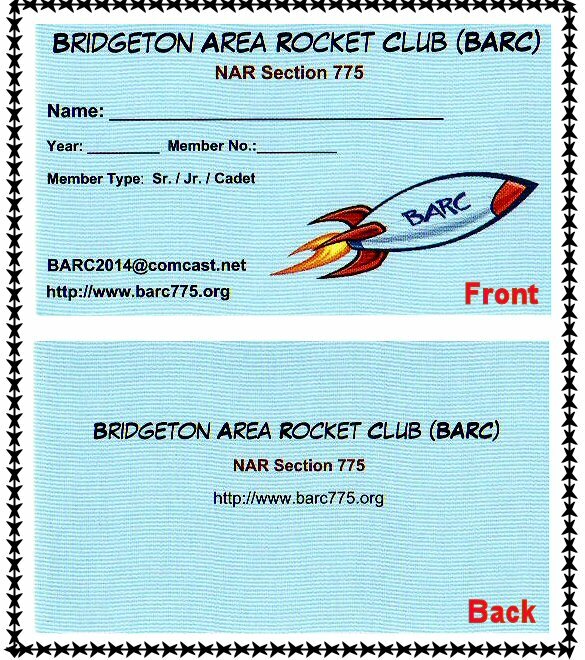 Signed original forms must be provided to the BARC Secretary to receive your membership card. Members must also follow our Ballistic Impact Corrective Actions that govern our launches. Members renewing a membership (assuming no changes to the information provided on their prior application form) need only send their membership payment. Send the appropriate fee (depending upon the date you join) for the membership level (listed below) from your PayPal account (send money) to BARC2014@comcast.net using the “Friends and Family“ option. Senior Membership ($25) – Individuals 18 and older who are not part of a Family membership. Junior Membership ($20) – Individuals ages 14-17 who are not part of a Family membership. Family Membership ($40) – Immediate family members (flyer, spouse / domestic partner, & children ages 14 -17). Educational Team Membership ($40) – For high school/college/university team built rocket launches (10 members / team max, excluding the team advisor when that person is not part of the team, as in a TARC team). Team members seeking HPR certification must join BARC at the junior or senior membership level prior to their certification attempt. Join date (September 1 – November 30): Fee is 50% of those listed above. Children under 14 years old fly free (A-D impulse class motors only) provided that a parent / legal guardian is a BARC member and present at the launch directly supervising their activities. HPR fliers may also add the calendar year, single payment, launch fee of $60 to your membership payment, or pay a $10 launch fee at each launch. NOTES: (1) When using PayPal please DO NOT select the “Pay for goods and Services” option as that incurs a service fee ($1 for memberships and $2.50 if paying the yearly launch fee). If you feel the need to select that option, please add the appropriate service fee to the amount sent to BARC. (2) eCheck payments take 3-5 business days to clear. Those who complete this process will receive their new membership cards at a BARC launch or meeting – you may also join at any club launch or meeting.